Right then, it’s that time of year when I review last year’s goals and come up with some new goals for 2019. It was a strange year because at the start I felt burned out after releasing Shadowhand and took a couple of months off development whilst I recovered. During this time I applied to the UK Games Fund for Ancient Enemy and went to a few conferences such as Games Forum London, Casual Connect (London), and GDC (where I spent most of the time at the first “IchiroCon”, which was epic.) Those conferences yielded some good contacts and information, and resulted in me publishing some Jewel Match Solitaire games on Steam for a German developer associate I met with at Casual Connect. Then I did a few updates to Shadowhand and began working on a casual port of the game with no combat (only puzzle levels), a modified story, and a less complex RPG system. I didn’t actually ship the casual version before starting work on Ancient Enemy (more on this in the Mistakes section below). Helen and I also did some planning for a new game which we’ll announce soon. We hope the news will make a lot of people happy. I also spoke at a conference in Latvia, where I made a good contact (more in this in a blog post soon!) Then I spoke at Develop in Brighton, and later in the year I got invited to speak in Dublin, Ireland. I also made a bunch of interesting data-filled blog posts this year and a video called “You are spending too long on your game“, which got shared widely. During the summer I found out that we weren’t successful with getting funding from the UK Games Fund and I tweeted that I needed some money to make my next game and prompty got 5 funding offers! That was pretty amazing and we ended up getting some financial support from Bithell Games, which is great. Around that time I also received a chunk of money from Video Game Tax Relief which I put towards Ancient Enemy development. So at the start of August I began work on Ancient Enemy (wishlist it!) and worked on that for the remainder of the year. We’ve got an all-star team working on this including Jim Rossignol (writer/designer), Jen Pattison (artist), Dan Emmerson (artist), and we’re just about to bring a well-known indie on board, which I’ll announce soon! We’ve probably got about 3 more months to go if all goes to plan because it’s supposed to be a short project utilising the existing (modified) Shadowhand engine. In September I flew to Boston for an “Ichirocon” and had a really great time. Hoping there will be one in 2019. In terms of revenue, this is what 2018 looks like. Basically 2017 was a poor year because we didn’t release anything until December. So 2018 was a definite improvement (+50%), though not as good as some past years. With the release of Ancient Enemy in 2019, and some other projects I’ve got in the works, I hope that 2019 can be a great year. Currently I’m feeling very positive, despite my Steam revenue dropping due to discovery algorithm changes in October 2018. I’m productive and getting good work done, and I’ve spent the year trying to make optimised decisions by applying the 80/20 rule where possible (look it up). I want to keep improving that way of thinking during 2019. Success rate = 2.5/4 = 62.5%. Not bad (and better than last year). If I’d got my act together I could have shipped Shadowhand Solitaire and scored 3.5/4 or started work on Ancient Enemy sooner. Success rate = 5/6 = 83%. This is a great score, much better than last year. I think these were reasonable goals and I made sure I did them. – Early in the year Cliff Harris said I should blog more often. And so I wrote a bunch of informative blog posts that got widely shared and were a factor in me doing talks and getting funding for Ancient Enemy. I even turned down two international talks because I was too busy with work and didn’t want to travel. People even mentioned my blog posts in their GDC talks and articles. So I think I got a good visiblity boost within the industry this year and I also had a fun year networking. – I wasn’t expecting to turn into a “publisher” but it’s worked out pretty well. So far I’ve published three Jewel Match Soltaire games on Steam and there are more coming in 2019. It’s bonus money and helps with my branding as a card game developer. – I went to a couple of great Aikido courses. My Aikido has been changing in the last few years as I gain more understanding of different principles from different teachers. – I had nice a Christmas break at home and I played tons of games. – I lost some weight, which wasn’t a goal I’d set, but I just did it anyway. I’ve also been using my standing desk a lot and my legs and back feel stronger. – I didn’t get going fast enough with new projects after shipping Shadowhand. To be fair this was because of burnout and it happens to me pretty much every time I ship something but it was quite powerful this time. – I didn’t ship Shadowhand Solitaire in the summer. I only needed a few more weeks to finish it and if I had shipped it then by now I would be receiving income from it, which would have been REALLY useful. This is because I didn’t want to delay working on Ancient Enemy after I got the funding and the team together. I’ll probably go back to this after Ancient Enemy ships, but the casual markets have declined further in 2018 and it is really starting to look like a non-viable earner. – Early in the year I had a meeting with a large mobile game dev company and I had the possibility of making a deal with them about a certain IP we own. However, I just couldn’t work out a deal that I was happy with. This was during my burnout period and thinking back on it, maybe I should have persisted more and tried diferent approaches. However, the rest of the year has worked out anyway and I’m happy with what I’m doing now. – I put the weight I lost back on in the run up to Christmas. To be honest I was just enjoying myself eating food and feeling that “hibernation” vibe. But it’s OK as my BMI is still in the normal range. – I wish I’d done more art and music and spent more time with my youngest son who is 15 now (though we did get into watching Brooklyn 99 together, which is great). 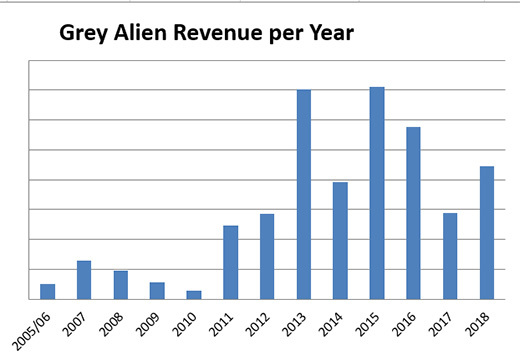 1) Grey Alien Games’ revenue is over $100K. This is reasonable based on past years but a lot depends on the timing and success of my upcoming projects. 2) I ship Ancient Enemy before June 2019. 3) I ship secret project 1 in Q2. 4) I ship secret project 2 in 2019 and it is at least part-funded by Kickstarter/an investor/grant. 5) I stay in business until the end of 2019. I’m breaking my usual rule of only working on one project at time in 2019 but I’m aiming to work with other reliable people to get stuff done so that I’m no longer the bottleneck in my business. That should also free me up to do more biz dev, which has been succesful this year, in order to create more opportunities. 1) Ancient Enemy breaks even. Whilst I’ll do everything I can to make this happen, it’s mostly out of my control due to market forces, so I won’t make it an official goal. 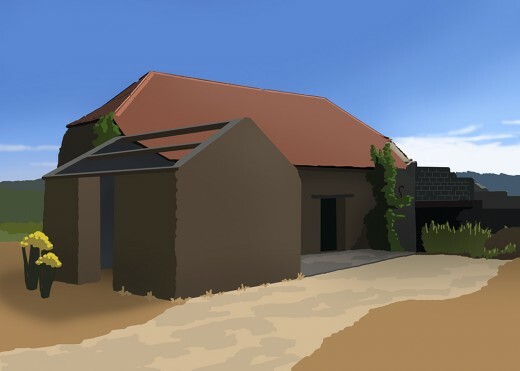 2) I start work on a new game (preferably our own IP.) Self-funded if I have enough $, otherwise externally funded. 1) Get my weight down to 65Kg (its 67kg right now, so this isn’t too hard) and maintain that to the end of the year. 2) Go on 10 nice walks/daytrips/long weekends with my wife. 3) Help my eldest son to pass his Aikido black belt. 4) Have a week long staycation, probably after Ancient Enemy ships and the dust settles, but maybe before if I need it. 5) Go on a week long vacation with my wife to Wales or Scotland, or maybe Ireland, and look at castles and standing stones. 6) Spend more time with my youngest son (playing games, watching TV, cinema etc). This should probably more specific, but I’m going to go with gut feel on this by the end of the year. 7) Finish my Cyberjam game in pico-8. That’s more goals than last year and I’ve missed off things like make art and music, but I’ll probably do some of that as well anyway and I don’t want to make the goals list too long. 1) Pay our joint account back some of the money we have loaned my company in recent years. I’ll put a figure of £10000 on this. 2) Make another mortgage lump sum overpayment at some point in the year. Minimum £2000. I only did two proper digital paintings in 2018 but I think they turned out well. 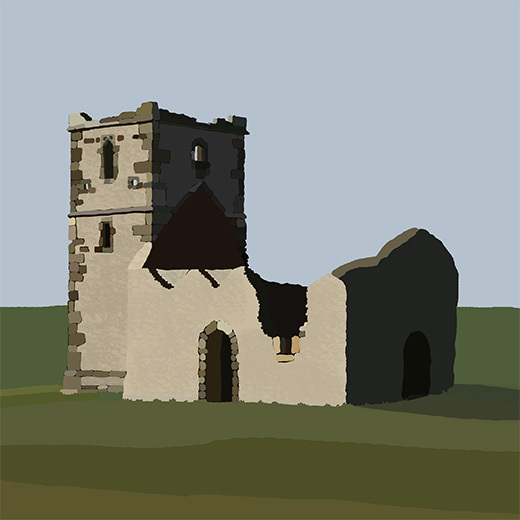 This is a ruined church in Dorset that sits inside an ancient circular earthwork. And this is a ruined barn close to where we live that I took a photo of during the very dry summer we just had. I also did a bunch of mockup art for our new game Ancient Enemy like the logo below which became a reference for the final logo. You can wishlist Ancient Enemy on Steam here. Earlier in the year I dabbled with some pixel art but never did any more until the end of the year when I did a gamejam using Pico-8! 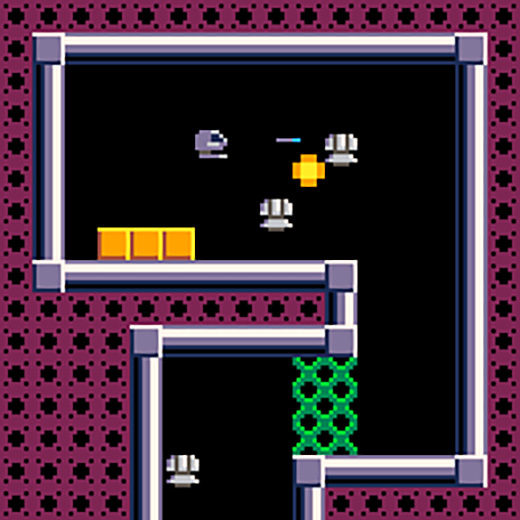 This game is called “Cyberjam” and is inspired by Cybernoid and has some basic animated enemies and explosions. I’ll probably make a separate post about it soon. Anyway, I aim to make some more art in 2019 because I enjoy it and I think I’m improving. You are currently browsing the Grey Alien Games weblog archives	for January, 2019.